"These smell like a walk through a county fair, and they taste heavenly!" In a large bowl, beat egg white with water until frothy. Stir in pecans and mix to coat. Combine sugar, cinnamon and salt and stir into pecan mixture. Spread on a baking sheet. Bake in preheated oven 1 hour, stirring every 15 minutes. Store in an airtight container. I made these low carb, using splenda instead of the sugar. They came out perfect. This was exactly what I had been hoping for. I added 1/2 teaspoon of vanilla extract to the egg white and water mixture. Reminds me of the nut snack I had at the Baldknobbers show in Branson, Mo. 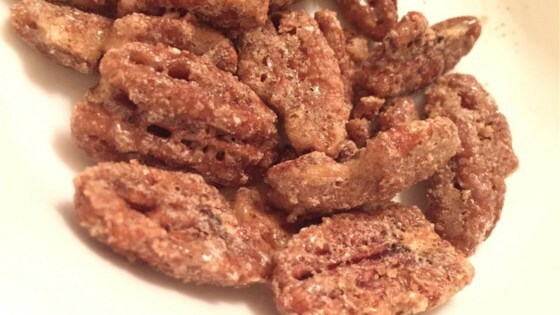 I use a heaping tablespoon of cinnamon and a little more than four cups of nuts (usually a mixture of pecans, walnuts, and almonds). Very addictive! So super quick and easy to make. My family LOVED these so I made them again the next day. YUMMY!